New aluminum 15 lb CO2 cylinder with handle and CGA320 carbon dioxide valve. 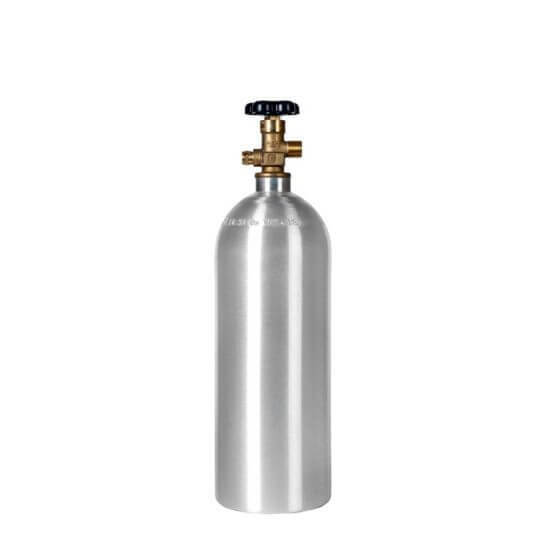 In the middle of the midsize CO2 tank range, this cylinder offers large capacity in a still-portable and easily storable package. Perfect for service and moderate industrial uses, including beverage delivery, soda, and aquariums. Premium 15 lb aluminum cylinder features precision craftsmanship in design and construction, with thick, strong walls and brushed exterior. Corrosion resistance, light weight, and low-temp performance also come standard.